Além das questões abaixo apresentadas na ótima matéria, gostaria também de destacar a importância em se testar / comissionar o sistema de grupos moto-geradores em condições que exponham eventuais deficiências em seu sistema de arrefecimento, seja ele a água ou a ar. Acesse aqui a matéria em sua fonte. Mechanical engineers should design generator set rooms so that the electrical system meets the design goals set by the owner and electrical engineer. 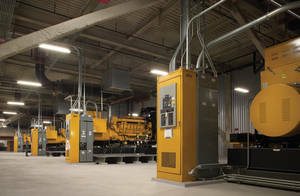 Understand that indoor generator sets require special attention to accessibility, code, airflow, and other factors. Know how to design a genset room to meet optimal system performance. Electrical power is essential to business continuity and life safety. Even a brief disruption in the electrical power supply can be costly. A backup generator set (genset) is an important line of defense for business owners that offers the ability to start and assume electrical load in a few seconds, providing power when the utility supply has failed. Recirculation and bypass airflow is minimized; noise and vibration within and outside the building complies with code requirements, and ancillary components external to the generator set operate reliably. Proper ventilation of the generator room is necessary to support the engine combustion process, reject the parasitic heat generated during operation (engine heat, alternator heat, etc. ), and purge odors and fumes. Generator-room temperature, ventilation airflow, ventilation air cleanliness, and air movement are critical design parameters that must be analyzed during the design process to ensure optimal and reliable operation of the generator set. It is critical that an adequate amount of ventilation airflow be delivered to the generator room. For the same generator size, there can be a reasonable variation in required airflow between different manufacturers. Table 1 indicates the ventilation airflow requirements from different manufacturers for a 2-MW, standby-rated generator set with unit-mounted radiator. If the product specifications are nonrestrictive, the design should be based on the worst-case scenario to avoid wholesale revisions in the future. Under fully loaded conditions, the temperature of flue exhaust from generator sets can be in excess of 900 F and the radiator (engine-driven or remote) discharge air temperature can be in excess of 160 F. Any recirculation of these high-temperature airstreams can cause the ventilation air temperature to exceed the ambient temperature. Recirculation is specifically influenced by the prevailing wind speed and direction—the two variables that cannot be controlled and are difficult to incorporate in design calculations. The thermal contamination of ventilation airflow should be eliminated or minimized. Generator-room temperatures in excess of 104 F typically require de-rating of the generator set and potential upsizing of components to support the design electrical load. The magnitude of de-rating varies with manufacturers, generator set capacity, engine fuel type, and more. Typical de-rating of 10% to 15% per 18 F rise over 104 F can be expected. De-rating becomes steeper for room temperatures above 122 F. High generator-room temperatures also necessitate de-rating of electrical equipment and components that typically are located within the generator room, such as transformers, switchgear, and electrical feeders. Assuming that the ventilation airflow temperature equals the ambient temperature can be a critical design flaw, and abatement methods can be costly. Once the proposed locations of flue exhaust, radiator discharge, and ventilation air intake have been identified, it is recommended that wind-tunnel testing or computational fluid dynamics (CFD) modeling be conducted to establish proof of concept. This is especially essential for gensets that are expected to operate at 100% rated power or serve critical applications such as data centers. Wind-tunnel testing involves the creation of a scale model of the generator-room building and other buildings and structures in its vicinity. The model is placed within a wind tunnel and tracer gases are released from radiator-discharge and flue-exhaust locations. The concentration of gas at the room’s ventilation air locations is measured by receptors for varying wind speed and direction. The data are correlated to local meteorological data to predict the degree of recirculation and peak ventilation air temperature anticipated at the generator room. If wind-tunnel testing cannot be performed due to budgetary or schedule constraints, another option is to use CFD modeling. Programs are commercially available that are adept at performing outdoor CFD analysis. The trade-off is limited ability to incorporate wind effects and surrounding conditions. Radiator discharge and flue exhaust can also impact the performance of equipment outside and in the vicinity of the generator room. For example, recirculation of radiator-discharge air or flue exhaust can impact performance of heat-rejection equipment such as air-cooled chillers, condensers, cooling towers, and dry coolers. Wind-tunnel testing or CFD modeling should include nearby equipment if deterioration in performance is anticipated. Also, flue-exhaust odors can be entrained into outside airstreams of air-handling equipment even if code-required clearances are maintained, thereby affecting the indoor air quality. Air-handling equipment in the vicinity of flue-exhaust locations should be included in the wind tunnel or CFD study, to ensure there is no recirculation. Esse post foi publicado em Artigos Tecnicos e marcado Consulting - Specifying Engineer, Generator Rooms, Geração em Emergência, Operação & Manutenção, Projeto Elétrico, Sala de geradores, Salas de Grupo Moto-Geradores. Guardar link permanente.